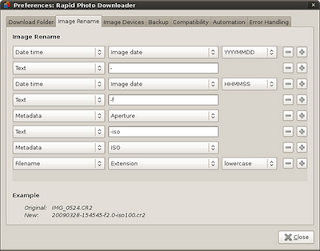 I am the developer (author) of Rapid Photo Downloader. This is a free software program written for professional and amateur photographers. 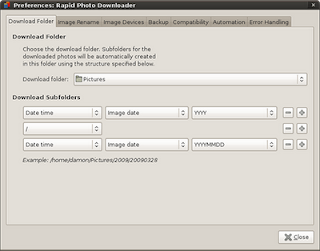 It helps photographers by downloading photos from their memory cards onto their computer, renaming them in a format specified by them. It can also backup the images as they are downloaded. It includes features to help them do this as efficiently as possible. For example, it can download from more than one card reader at the same time, which is especially helpful when a photographer returns to their computer with hundreds if not thousands of images (which is more common than you might imagine, especially for people like wedding photographers). It has taken more than a thousand of hours of my time to do this. Why would I do such a thing, and charge nothing for it? I have several motivations. First, I see it as an act of service. Second, I see it as part of a contribution to a bigger movement, the free software movement, which was founded by Richard Stallman. With free software you can be a good neighbor and share it freely with others. You are encouraged to do so! People can use it without having to pay money for it. I firmly believe that free software is a much closer fit with human rights and global solidarity than the combination of proprietary software and capitalism. Proprietary software—which by its very nature is not free—has led to a small number of people becoming incredibly wealthy, with significant control over what users can and cannot do with their software and their data. This goes against the central tenet of democracy, which is that people have the option to meaningfully participate in decisions that affect their lives. Free software is more democratic and respectful of the user. Currently proprietary software is the dominant form of software on most people's laptops and desktop computers, but free software like the Firefox web browser is becoming increasingly popular. Linux is the most popular free operating system. Millions of people use it on their desktops everyday, in government and industry, at home and in civil society organizations. It has already proved a marvelous success. But compared to Windows and Mac, not enough people use it. I wrote my program so that I can help free software, and Linux in particular, become more popular among photographers. 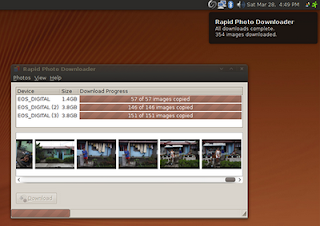 Only a small percentage of serious photographers use Linux. Many more could be using it in future. My humble little program is a small but important tool that can help prompt photographers to see what free software has to offer photography, and to be part of a movement that encourages the development of better free software programs for everyone. As I mentioned, I also wrote this program as as act of service. I see it as one way of giving back a little of what I have received from others. I would not have been able to create this program were it not for the hard work of many others—including especially my teachers, and those who wrote the software without which my own program could not be developed or run. I was fortunate to receive an excellent education in computer science—two years at Victoria University of Wellington, and one semester at the University of California at Berkeley. Many people do not have access to the quality of education I received, even when they have the talent and desire. With free software, not only can they run the program, but they can study it and improve it if they wish. Ubuntu is an African word meaning 'Humanity to others', or 'I am what I am because of who we all are'. The Ubuntu distribution brings the spirit of Ubuntu to the software world. I am very pleased to be able to make a meaningful contribution to the free software movement. For some time it has been one of those things I would like to achieve before I die. Thanks a lot, you have certainly been a good neighbour to me. Thanks for this helpful app. I was really in need of something like this so I'm very glad I've found it. I'm going to promote RPD as much as I can because is not very well known. I've really enjoyed too your thoughts and photographs. The world needs more people like you. I wish you the best!